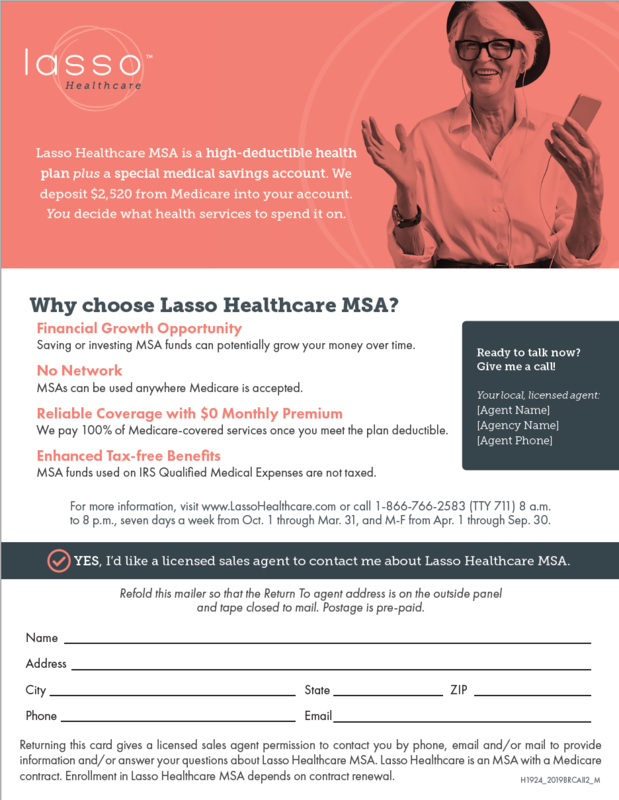 Lasso Healthcare has done a tremendous job with supplying plenty of MSA marketing materials for agents to use. 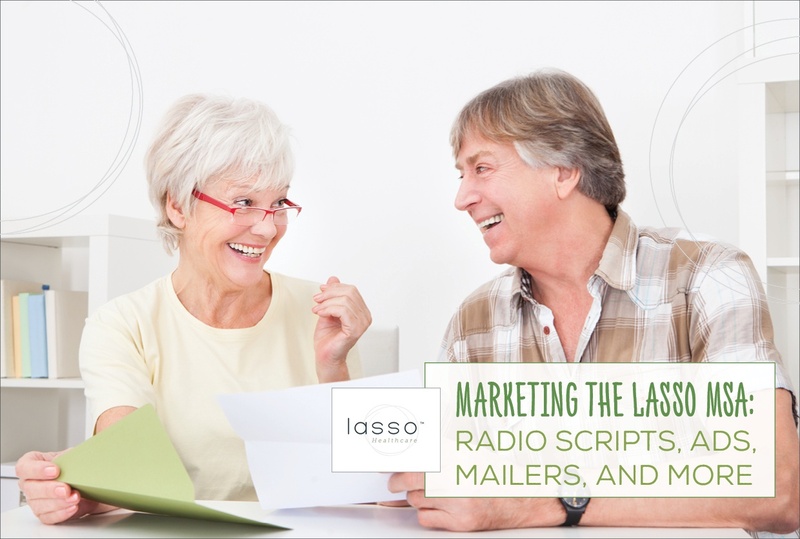 Our in-house marketing team has also developed additional marketing materials to help you gain traction, educate consumers, and ultimately sell the Lasso MSA. These are all CMS-approved. 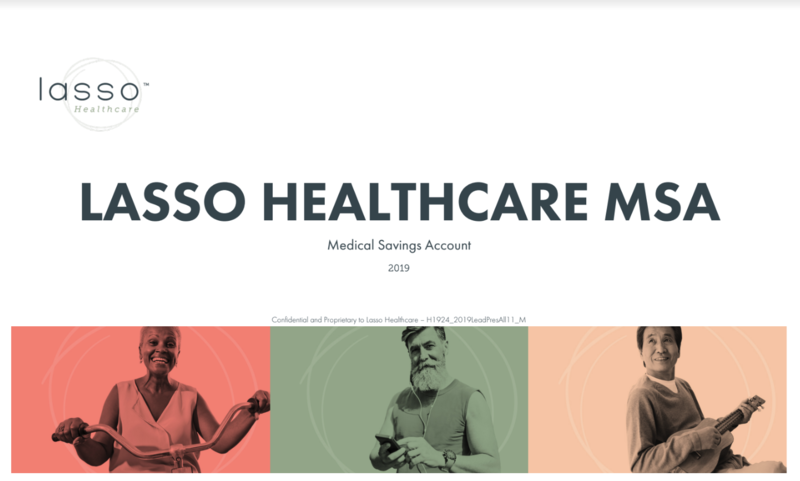 If you’re brand new to the concept of the Lasso MSA, you can learn all of the details by reading What Is the New Lasso Medical Savings Account (MSA)? As a contracted agent, you have access to lead-generating materials as well as materials you can use with existing clients. We'll also cover an important note about marketing compliance. Both presentations go through how the MSA product works in great detail with special agent notes. This allows you to read from their recommended script as you go through the slides. The "Individual" presentation includes the agent notes throughout the presentation, while the group presentation has all of the agent notes at the end. Use the presentation that fits your style the best. 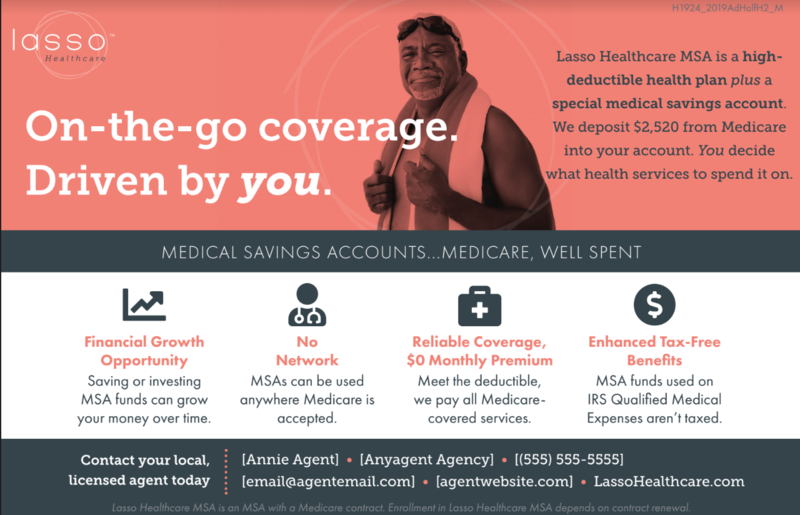 Lasso Healthcare has provided us with two newspaper ads: a full-page ad and a half-page ad. The full-page ad is more spaced out, which gives the ad a good amount of breathing room. It’s generally easier to take in a full-page ad, because there’s not as much text crammed together. You also have the advantage of taking up more room, which will undoubtedly get more eyes. The obvious downside to the full-page ad is that it’s going to be much more expensive. However, the half-page ad sends the same message, and it’s going to cost you a lot less. The cost of a newspaper ad is going to depend heavily on where you live and how popular the newspaper is. Even in the same city, two different papers can have tremendously different costs. The way newspapers ads work is that you’ll likely pay for your ad to run over a number of weeks. For example, you might pay for your ad to have a 7 or 14-week run. The longer you book, the cheaper it is in the long run (generally). As an example, one of the less expensive newspapers here in Decatur charges $336 for a half-page ad and $672 for a full-page ad. However, they offer a discount with a 13-week contract. Newspapers might not be as popular as they used to be, but they’re still a particularly great way to reach the senior population. Get in touch with your local papers to get an idea of what the investment might look like for you. You can always ask if there’s a “trial run” where you can run your ad for a couple weeks to test the waters. However, keep in mind that the more an individual is exposed to an ad, the more likely they are to take action. It’s fairly uncommon for someone to take action the very first time they see an advertisement. For agents that are accustomed to sending promotional materials via postal mail, these mailers are going to be a turn-key solution for you. By returning that card, you the agent now have permission to contact them and talk about the Lasso MSA. Lasso has provided both full-color mailers as well as a black and white option. If you aren’t sure how to send these mailers (or who to send them to), we work with a company called LeadConcepts. They already have all of the files for the Lasso mailers/business-reply cards. Any replies get sent to LeadConcepts, and they are forwarded on to you. 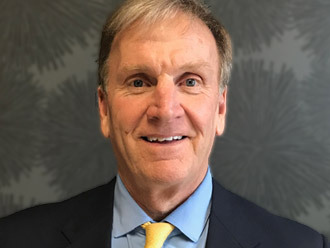 Steve Weir at LeadConcepts has told us that there are already several orders out targeting ages 65-74 years old with household incomes between $30,000 and $100,000 annually. The current pricing is between $460/m and $590/m depending on which mailer you choose (color costs more). CMS has approved two radio scripts that you’re free to use in your marketing efforts. These are scripted by New Horizons. It's important that you don't change any of the words in the script for this to remain CMS-compliant. The scripts are 15 and 30 seconds long. Simply customize the ad with your phone number, and you're ready to go! If you’re interested in trying these out, get in touch with a few local radio stations. They will guide you by explaining how much it costs for which time slots, and they’ll also help you get a voiceover for the scripts. Client leave-behinds can come in handy if you’ve talked about the Lasso product but the individual isn’t ready to commit yet. 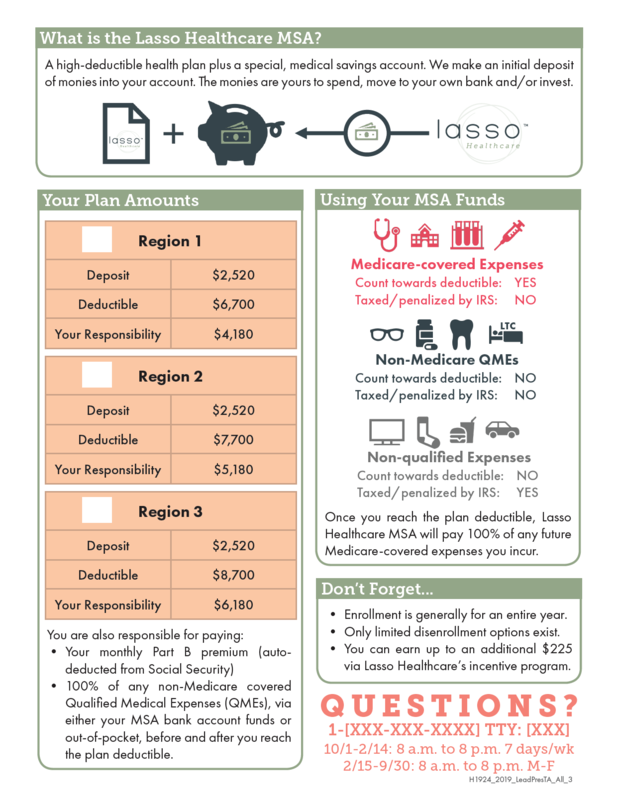 The 2019 Client Leave Behind is very consumer-friendly as it explains plainly how the MSA works. You have the option to check off which region you’re in (which will determine your client’s deductible), and you can also customize the leave behind with your contact information. If you have the capacity to add your own contact information, you can do it on your own computer. If you do not have the capacity, Jason Ferguson can add it for you. While we are firmly in the digital age, traditional billboards are arguably just as effective today as they used to be. A 2017 Nielsen study showed that 40% of people surveyed said they visited an advertiser because of their billboard. (Four thousand people were surveyed.) Twenty-four percent said they made a purchase due to the billboard. It can be very difficult to stand out in a crowded digital space. What makes things even more challenging is that it takes between 16-20 impressions before a consumer actually notices your brand. By taking your message offline and using multiple mediums, such as Facebook or Google Display in addition to a billboard or newspaper ad, you may just find that over time, your digital ads have a greater impact. You get that localized feel that a billboard brings coupled with the gentle reminder from your Google and/or Facebook advertisements. The cost of a billboard varies depending on the city and state, the location in that area, the size of the billboard or poster, and the length of the contract. The static posters (10'6" x 22'9") are $500 per four weeks per location for the space, and $150 per poster flex. The digital posters are $1000 per four weeks per location. There are 14' x 48' bulletin locations, and they range in space cost from $1000-$1500 per four weeks depending on location and length of contract, and the vinyls are $1050 each. Billboards are an investment, but they can be very effective. Often times, the hardest part is coming up with an effective billboard design. That's why we decided to put our heads together and develop a billboard template for our agents to customize and use. We went through dozens of mockups and ideas before settling on the following design, which has 4 variations to choose from. The message is concise and points out some of the largest draws of the Medicare MSA. This design fits a 14x48 bulletin or a10'6" x 22'9" poster, which are the most common sizes for a billboard. When you download the Lasso Marketing Kit, you'll have access to all of the source files, which are editable. If you're not savvy with Adobe design software, you can give the file to the billboard company, and they have designers that can easily swap out the placeholder information with yours. This is very important – if you end up customizing any of these marketing pieces, please send a copy of that to us here at New Horizons. We will then send these to Lasso so that it’s on file. This is just an extra step we all have to take in order to remain compliant. If you’re not yet contracted to sell the Lasso MSA product, don’t wait any longer! You can hear all about some early agent success stories by listening to one of our Lasso MSA Roundtables. Not contracted to sell the Lasso product? Get contracted now.